There is rarely anything more satisfying than a bowl of hot steaming stew in the winter time. What’s even better is when it takes no more than 15 minutes to prepare, then you stick it in a slow cooker, hop off to work and come back 8 hours later to a pot of deliciousness. To adapt for the oven, place in a casserole dish with a tight fitting lid on 160 degree (fan) or 180 conventional for 3 to 3.5 hours. Add the garlic, onion, herbs, bay leaves and carrots to the same pan and fry for 5 minutes until the vegetables have softened slightly. 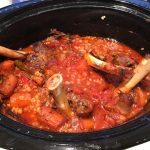 Tip the vegetables into the slow cooker, add the lamb shanks and add all remaining ingredients. Ensure the liquid covers the barley and try and immerse the shanks in the liquid as much as possible. Set the cooker to low and cook for 8 hours. 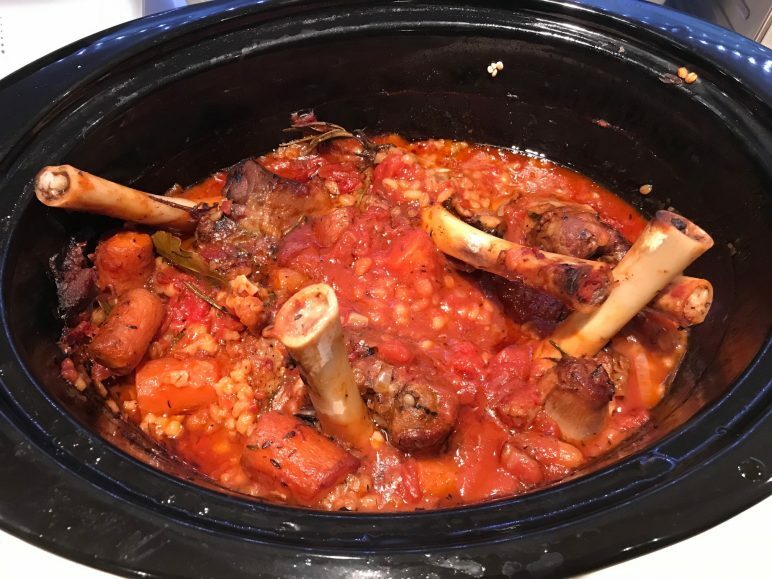 Allow to rest for 15 mins with the lid on, then remove the lamb fat from the top with a spoon and serve with some fresh vegetables or crusty bread.